Charles Sturt (1795 - 1869) as in Sturt's Pigface, was an explorer who in 1844 battled the harsh arid interior of SA in search of an Inland Sea and to be the first to reach the center of Australia. Currently there are 17 spp. 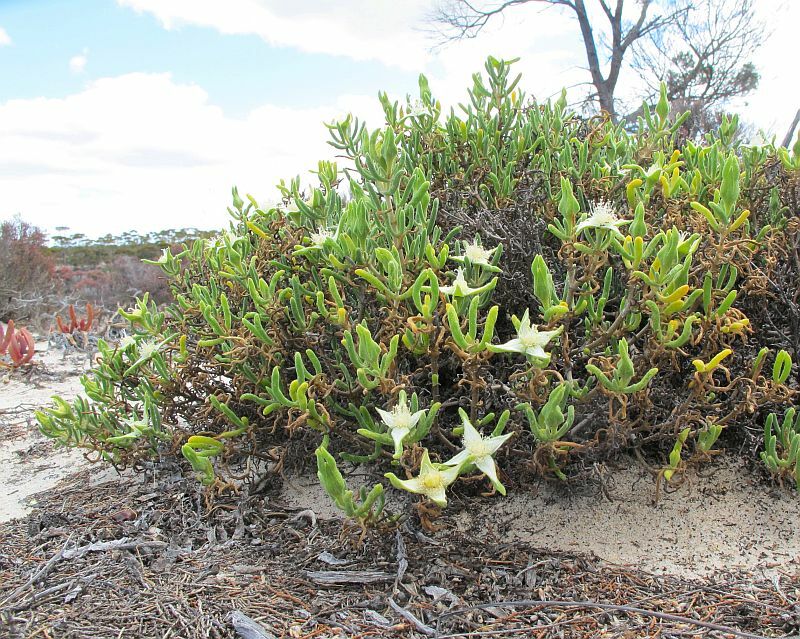 of Gunniopsis (2 undescribed), with the vast majority occurring in the lower half of WA, most of SA and extending into the NT, Qld and NSW, which coincidently is also the distribution of Gunniopsis quadrifida the most common and widespread species. 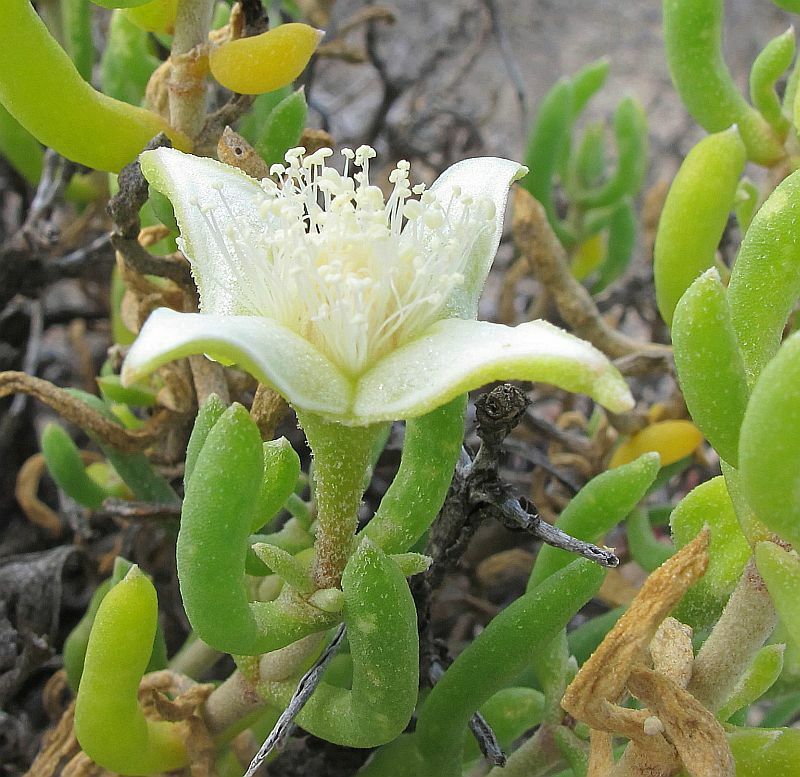 Although locally poorly collected, it can be found on and around saltlakes to the NE and NW of Esperance, but is more common further north and to the very center of WA. So this and other species are well adapted to hot, dry, alkaline and often saline conditions. These plants are similar, but differ from the introduced (Iceplants) Aizoon and Aizoanthemum genera by having only 4 sepals (the others 5) and the leaves are always opposite. 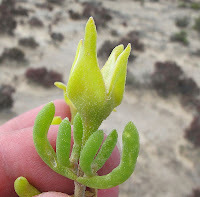 Also due to their hot/dry habitat preferences most are succulents, with Gunniopsis quadrifida generally having in cross-section rounded (terete) leaves. 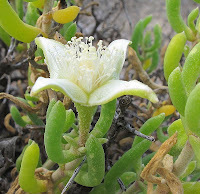 Gunniopsis quadrifida is also a woody shrub, a characteristic it only shares with a SA species G. tenuifolia, but that species has yellow/green flowers. 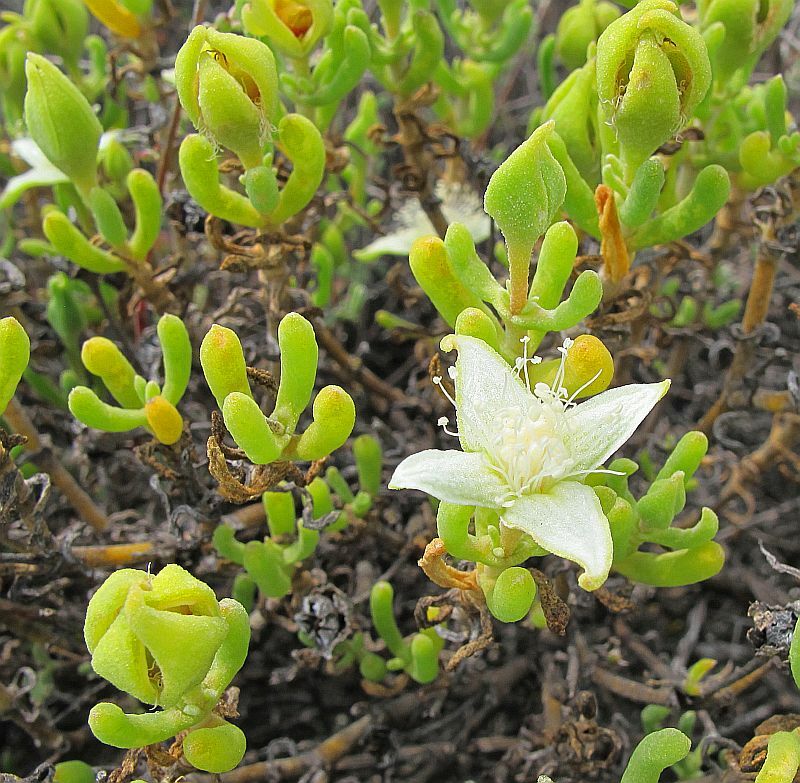 The flowers do not have petals, but are nevertheless still eye-catching by having their inner succulent sepals brightly coloured, which with Gunniopsis quadrifida are white. They can vary in size, but locally 2.5 cm (1”) diameter are common-place, which when caught in full bloom can provide a striking display (note the developing buds in some photographs above). 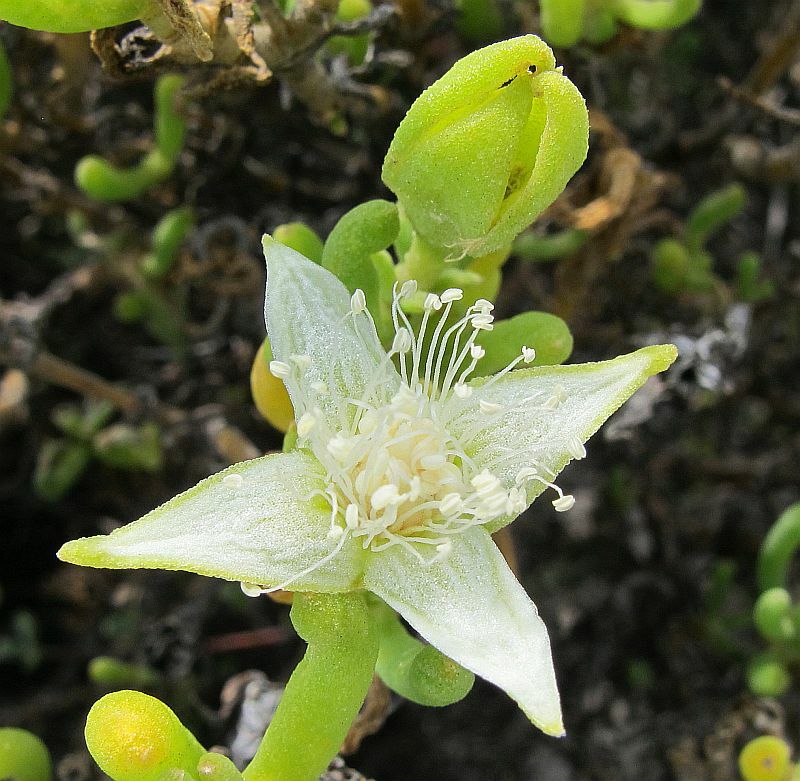 However good displays are dependent on the weather (preferring warm conditions), but flowers (apart from winter) can be encountered at almost anytime of the year with moderate summer conditions producing the best results. Gunniopsis quadrifida produces 4 compact bundles of stamens that are positioned between the sepal lobes. 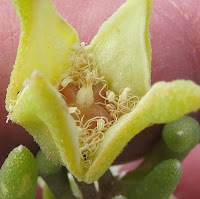 The seed capsules have 4 pronounced ribs that split to release the (distinctive to species) seed, which with this species are black with small rounded swellings (tuberculate). The genus Gunniopsis belongs to the Aizoaceae family. J. Adelaide Bot. Gard. 6(2): 133-179 (1983) SA Herbarium.